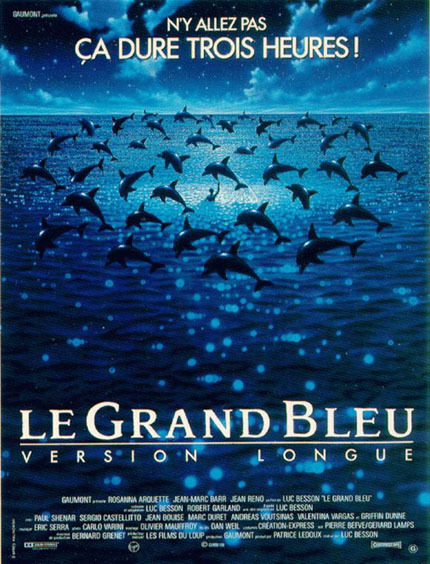 Jacques Mayol & "Le Grande Bleu (The Big Blue)"
In the late sixties Jacques Mayol and Maiorca achieved depths approaching 240 feet. Physiologists, groups of whom curiously follow free divers, cautioned them against going deeper. The limit, they said, would be not breath-holding capacity but water pressure, which below 325 feet, they calculated, would collapse the chest like an empty soda can -- an effect known as thoracic squeeze. But Mayol was convinced otherwise. During his studies of the diving behavior and anatomy of dolphins at the Seaquarium, near Key Biscayne, Florida, he witnessed autopsies that revealed no obvious anatomical structure preventing thoracic squeeze. The lungs and thorax were essentially the same in a dolphin as in a human being, yet dolphins survived great depths. Mayol was sure that whatever protected them would also protect people. Testing himself in waters from the Mediterranean to the frigid lakes of the Andes, and helped by a group of scientists, Mayol sought to understand what happens to the human body underwater. In a typical experiment, Mayol descended to 150 feet and held his breath for nearly four minutes with a cardiac catheter inserted in his chest. When in 1976 he defied warnings and, helped by a sled, went to 328 feet (99 meters, holding his breath for 3 minutes and 39 seconds. ), scientists confirmed the existence of "blood shift" in humans. We share this mechanism to prevent crushing -- a throwback to our evolutionary aquatic heritage -- with dolphins, seals, and other diving mammals. In response to pressure, the body constricts the blood vessels on the periphery, forcing blood from the extremities into the chest cavity. The thoracic cavity becomes not like an empty soda can but like a full one, blood being incompressible. Blood shift protected Francisco 'Pipin' Ferreras, another native of Cuba who now lives in Florida, when in 1990 he broke Mayol's record for no-limits free diving by going to 367 feet. In 1991 Umberto Pelizzari, Ravelo's nemesis in constant-weight free diving, broke the no-limits record by going to 387 feet. Francisco 'Pipin' Ferreras new world record achievement on December 17, 1994 in Key Largo, Florida, took him down just beyond 416.6 feet (127 meters) in two minutes and 28 seconds. In 1996, he broke his own record again, the new record is 433.7 feet (132.2 meters), which required him to hold his breath for two minutes and 18 seconds.